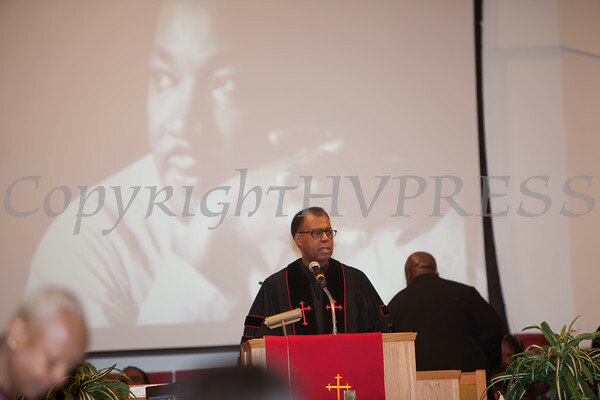 The Christian Ministerial Fellowship of Newburgh & Vicinity held its 44th Annual Martin Luther King Jr Celebration on Tuesday, January 15, 2013 at Mt. Carmel Church of Christ Disciples of Christ in Newburgh, NY. Rev. Dr. Thermond Herring Jr., Pastor of Mt. Carmel Church of Christ Disciples of Christ says a few words at the Christian Ministerial Fellowship's 44th Annual Martin Luther King Jr Celebration held on Tuesday, January 15, 2013 at Mt. Carmel Church of Christ Disciples of Christ in Newburgh, NY. Hudson Valley Press/CHUCK STEWART, JR.